Oh, Gina. How we missed you. “Sal’s Pizza” is by no means Gina-centric, but her presence underscores one of the show’s strengths, which is its consistent ability to entertain. This might seem fundamental to any TV show, but it is proving a significant challenge for network TV series to engage viewers over the course of a 22-episode season, particularly when the shows must compete with prestigious cable dramas and sitcoms that whittle content down to much shorter episodes-per-season runs. 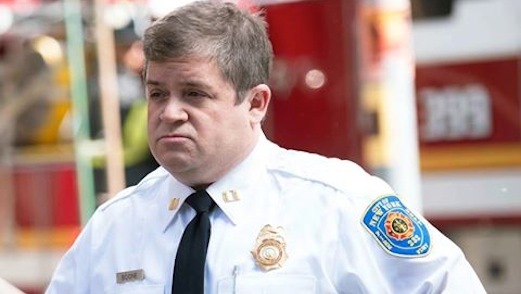 Exaggerated confidence was going around this week, as twitter darling Patton Oswalt made a guest appearance as the local fire marshall and Peralta’s nemesis. Both he and Jake are investigating a fire at the titular pizzeria, which served as the location for many highlights from Jake’s formative years. The bulk of the episode is devoted to this investigation, which adheres to the formula laid out in all previous episodes so strictly that Brooklyn Nine-Nine’s plotting can only be described as SVUian. But you know the drill: A crime is impossible to solve, Peralta breaks the rules, Peralta gets in trouble, all hope is lost until Peralta solves the case in the final five minutes. This specific plotline was particularly barren (although it did yield an inter-department brawl between police officers and fire fighters, à la Anchorman and, were it not for Gina’s intervention and Charles’ devotion to pizza mouthfeel, “Sal’s Pizza” would likely rank as one of the worst episodes of the show’s early run due to a lack of variation from the rest of the series. This is not to say that the episode was bad. Even bad, Brooklyn Nine-Nine is so, so much better than, say, Dads or The Big Bang Theory. But that is attributable again to a main cast that has no weaknesses. If there’s ever an episode such as this one where Samberg’s Peralta is limited to “You’re a fireman, so you should know how to treat that burn,” there are a half dozen co-stars to back him up by crushing Magic 8-Balls with their bare hands or describing the inside of cheeks as “thighs with tongues.” The series has come a long way in a short time from the pilot when it seemed that the series was destined to be carried entirely by Samberg and Braugher. “Sal’s Pizza,” despite its flaws, is a testament to that growth.